People with hardwood floors always wonder what the best method is to keep their floors clean. You can find a lot of different solutions and remedies when you look online, but sometimes the best way to keep your hardwood floors clean is to use a hardwood floor vacuum cleaner. Finding the best hardwood floor lightweight vacuum can be a daunting task, considering there are so many models available. Each of them claim to be the best, so it can be difficult to know which one is the right fit for your floors. With all of the different features that hardwood floor vacuums have, you can narrow them down quite a bit if you know what you need. For example, you may want a lightweight vacuum, so you can narrow your options down to vacuums that weigh 10 pounds or less. Some vacuums are corded and some are cordless. These are just some of the basic features of hardwood floor vacuums, but we are going to examine one of the best hardwood floor lightweight vacuums on the market that you can get for an affordable price. If you want a reliable hardwood floor vacuum cleaner that is lightweight and easy to use, then look no further. The Hoover Linx Cordless Stick Vacuum Cleaner, BH50010 weighs a minimal 10 pounds, so you won’t have to strain yourself if you are vacuuming a large area or even a small space. But just because it is lightweight doesn’t mean that it does a lightweight job. It is strong enough to pick up dust particles as well as larger particles and objects. This is possible because of the patented WindTunnel Technology that funnels larger items toward the center of the suction, while the outside picks up the smaller particles. This vacuum is extremely convenient since it operates with an 18-Volt Lithium Ion battery. The battery life depends on the surface that you are vacuuming. If you primarily have hardwood floors, then you will easily be able to vacuum your entire home on one battery charge. But if you will be transitioning from hardwood floors to carpet frequently, then the battery may not last as long since the vacuum is working harder on the carpet. It is available on Amazon for a reasonable price of around $130. 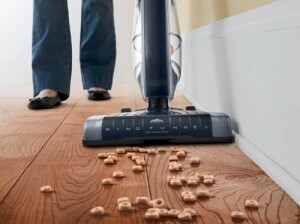 Here is another Hoover vacuum that is dependable enough to get a good clean on your hardwood floors. This vacuum weighs just about 14 pounds and is corded, so you will never have to worry about the battery running out on you in the middle of your vacuuming session. The most convenient feature of this vacuum is the recline handle that will allow you to reach under your furniture with ease. This vacuum has edge cleaning bristles that will allow you to clean close to baseboards and other objects without having to get a broom to clean the tight spaces. The swivel steering can be a little difficult to get used to at first, but once you get the hang of it, you will quickly realize that it is one of the best features that you’ve ever had in a vacuum. For a price of about $75 on Amazon, you almost can’t beat it. Bissell is another quality brand of vacuum cleaner, and this particular model is no exception. If you have pets at your home, then you already know how difficult it can be to maintain a clean house. 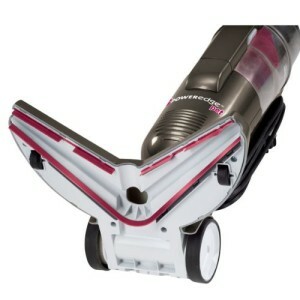 This Bissell vacuum has a V-shape technology that will filter large particles toward the center of the suction, while the outside of the V will pick up smaller debris, such as pet hair. This vacuum weighs just over 7 pounds, so it is very easy to get out of the closet and use any time you see a small mess. Pet hair, kitty litter and even dog food is no match for this vacuum. Even if you don’t have pets, you can imagine how well it would perform if it is able to pick up objects like that on a hardwood floor. The best part about it is that it is one of the most affordable vacuums, since it is available on Amazon for about $50.